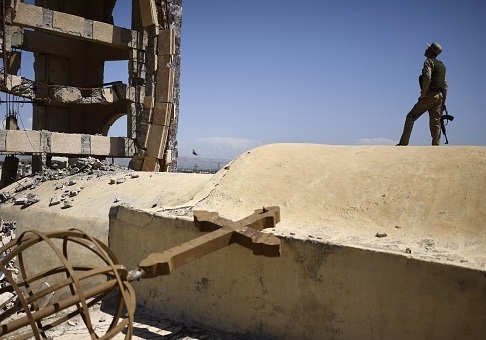 Programs to rebuild Iraqi Christian communities destroyed by Islamic State are being implemented with the support of $300 million from the United States. Approximately 40,000 Christians have returned home after escaping persecution at the hands of Islamic State. The U.S. Agency for International Development (USAID) is working with groups such as the Knights of Columbus to increase its efforts in northern Iraq, according to International Christian Concern. Last October, Pence told a conference hosted by nonprofit In Defense of Christians that America "will work hand in hand with faith-based groups and private organizations to help those who are persecuted for their faith." In June, Pence said the United States would intensify efforts to deliver aid to Iraqi Christians. At the State Department's first-ever Ministerial to Advance Religious Freedom in July, Secretary of State Mike Pompeo announced the United States would provide an additional $17 million for de-mining efforts in the Nineveh region of Iraq. Supreme Knight Carl Anderson expressed hope "that our joint and combined efforts will bring open and concrete improvement to the situation confronting minority communities targeted by ISIS." Nina Shea, director of the Center for Religious Freedom at the Hudson Institute, said USAID "has been very slow in getting aid out the door, and it’s just starting to make a difference, with reconstructing schools, electricity switched on, etc., since mid-September." Last week, the Knights of Columbus and USAID signed a memorandum of understanding to establish a relationship among the federal government, the Knights of Columbus, and local faith and community leaders to deliver aid to religious minorities in the Middle East. Fewer than 250,000 Christians are estimated to remain in Iraq, a decline of approximately 1 million people since 2002. Most live in the Nineveh Plains and Iraqi Kurdistan Region. ISIS entered the plains in 2014, leading to tens of thousands of Christians fleeing. Many went to Erbil in Iraqi Kurdistan, settling in churches and parks. Rex Tillerson, then the secretary of state, declared ISIS's actions against Christians and other religious minorities in Iraq to be genocide in 2017. This entry was posted in National Security and tagged Iraq, Islamic State, Religion, Religious Freedom, USAID. Bookmark the permalink.